Watch the new John Lewis Christmas TV advert and see Hare give his best friend Bear a Christmas he'll never forget. Set in a beautiful forest, poor Bear is the only animal that never gets to celebrate Christmas because he has to hibernate every year. However, this year is different. This year Hare has a brilliant idea. 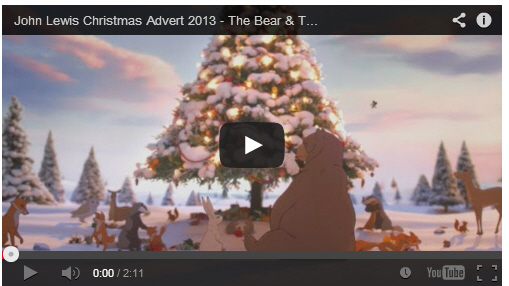 Though having only being in the public domain for a week, the Bear and the Hare ad from retail giant John Lewis has already been viewed almost 6.5 million times and shared nearly 650,000 times on Facebook according to Unruly Media, and has fought off competition from Samsung and Playstation’s latest ads to land the number one spot.